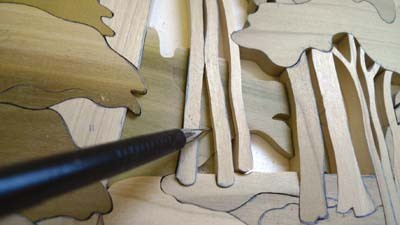 ...before gluing them onto the backing, and then applying a nice finish. Job done! 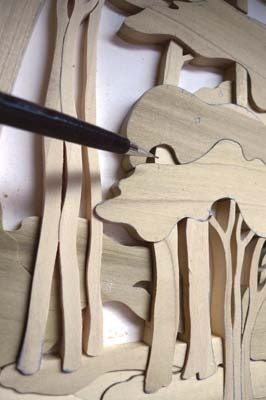 How to turn your holiday snap into a piece of Wood Art anyone would be proud to hang on their wall? Think maybe it is too involved or difficult? Think again, as it's a lot easier than you may imagine! Last week we showed you what to do after selecting your photo and enlarging it to A4 size. Simplify everything, forget about individual leaves and just mark out the trunk and the treetop as a whole, unless it's a really big tree! When you're happy with your line drawing, you may wish to make your picture larger still, especially if some of the details are small. There is a software program you can download from the internet called Rapid Resizer that can print patterns to any size, much more convenient than visiting the photocopiers. 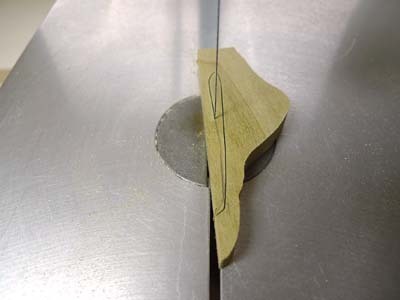 When all the main sections of the pattern have been cut out, change the No.5 blade for a smaller No.3 - this will keep the gap between the few remaining pieces within each section to a minimum. 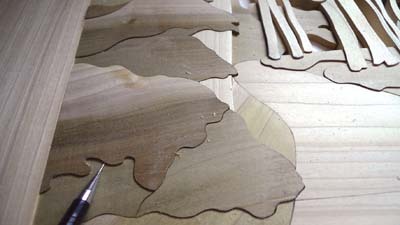 Number each piece as you cut for easy identification later. 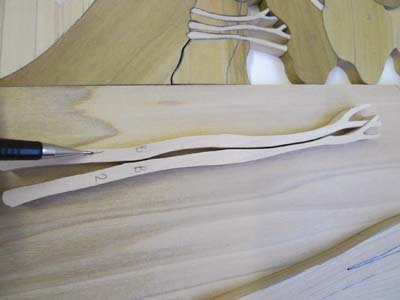 The only inner cut detail to be made is within the larger tree trunk that looks like the eye of a needle. 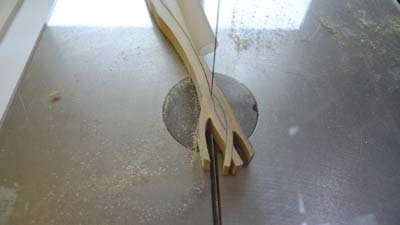 After drilling the blade entry hole, check that the blade is 90 degrees square to the table before cutting out the piece. 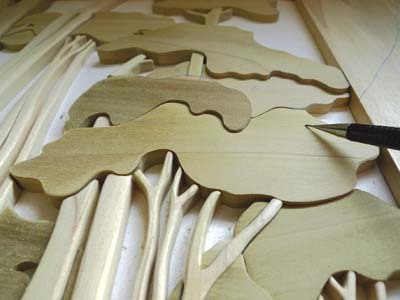 Place the cut inner piece onto a darker shade of wood, trace around the outline, then re-cut the piece using the darker wood and then place the newly cut piece into the tree trunk. 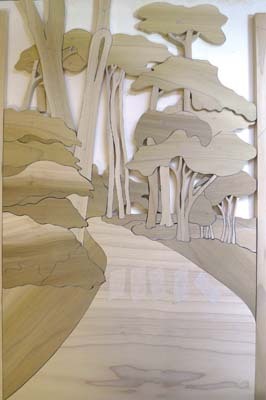 With all the pieces cut, the picture is really starting to come together. 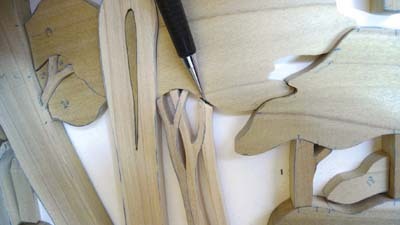 All that's needed now is some sanding to vary the heights to make it something a bit more special. The thing to remember with this initial sanding is that you're only creating different height levels. 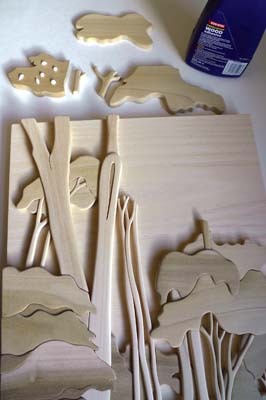 Giving the individual pieces, even a slight 3D appearance will really bring the picture alive. Try to visualise which piece should be higher or lower - is it closer to you or further back in the distance? Try to imagine how you would like the picture to look. 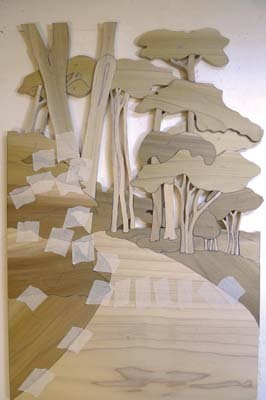 Always start by lowering the pieces that are the furthest away from you in the perspective of the picture, in this case the background bushes between the tall tree in the centre. 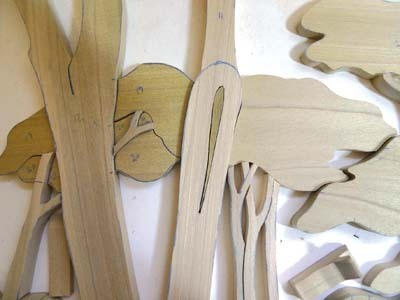 Sand these down to approximately 5mm and mark their height onto the adjoining tree trunks. 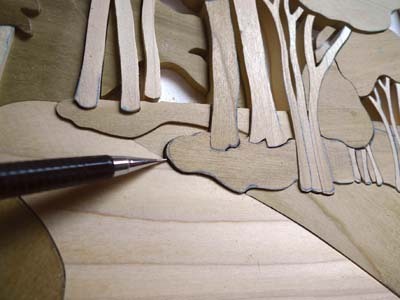 Then mark the height of the treetop (cut from 6mm tulip) onto the tops of the three tall trunks. Next, lower the height of each of the tall thin trunks, so they are below the height of the treetop, but stay above the ground. 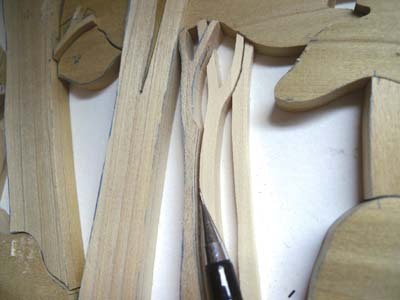 The third tall thin trunk on the right can be sanded a little lower to make it appear slightly behind the central trunk. trunk so that it remains just above the central one. 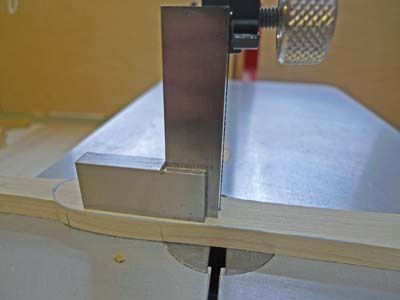 Lower the top section of the road by approximately 3mm, sanding it gradually to make a smooth slope down, and then mark its height on all adjoining pieces on either side. Slightly lower the pieces along the sides of the road, whilst leaving the pieces around the trees on the right and the bush on the left a little higher than the road. 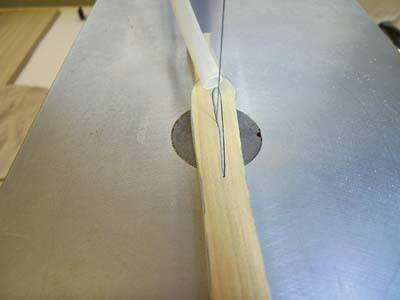 When sanding down the tree trunk that is made up of three separate pieces that go up through the treetops, try to keep the height consistent throughout. 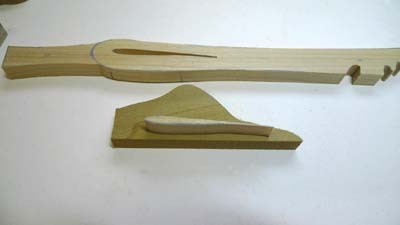 The bushes on the left-hand side have only minimal sanding, slightly higher or lower than the adjoining pieces. 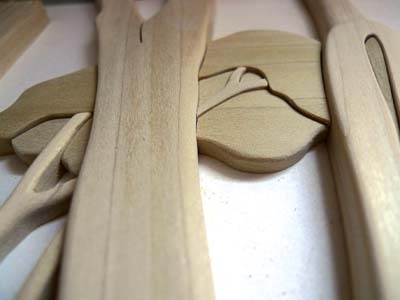 The branches on the top, left-hand tree can be lowered so that they are seen going through the underside pieces of the tree, but then disappear under the top of the tree. 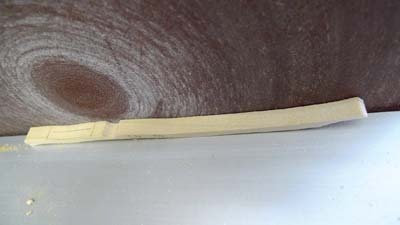 Here you can sand with the grain and remove any scratches left by the disc sander and round over the edges, but always be mindful of not sanding below your lines. 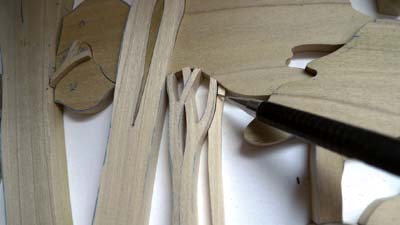 Return each piece often to its position to see how it looks. 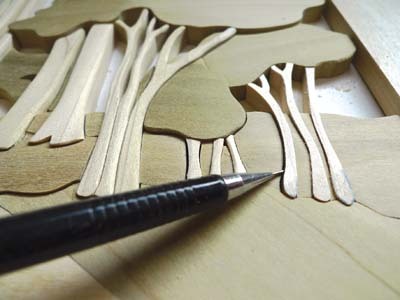 Once you are happy with the way the picture looks, hand sand all the pieces smooth with the grain using 180 grit and then 240 grit sandpaper. 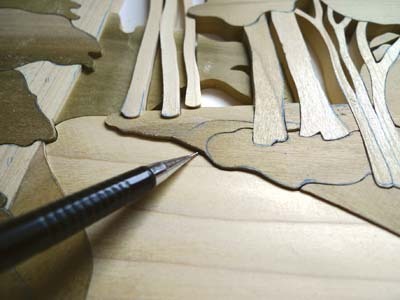 You can apply your finish of choice to the individual pieces now, or wait until the pieces are adhered to the backing. 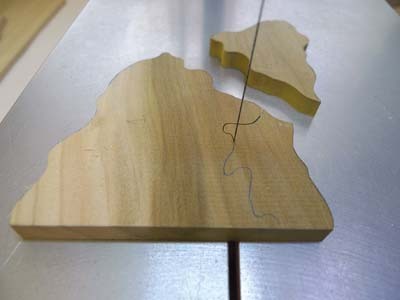 We have used 4mm ash faced plywood adhered to 12mm ply of the same size, for the backing of the picture - this will offer stability and a chunkier finish to the overall picture. 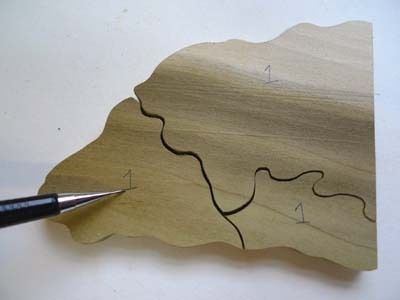 Use the outline around the pattern as a guide, sand the surface smooth, and remove any burr from the cutting lines. 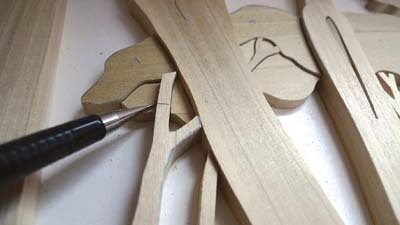 Lay the pieces out in order alongside the backing, then starting at the bottom, work your way up to the top, wiping away any glue that may have oozed out as you go. 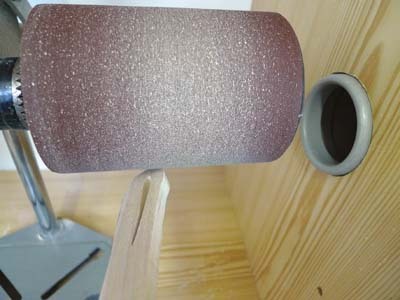 When dry, apply a finish of your choice if you have not already done so. You're now done and you can sit back and enjoy your art!